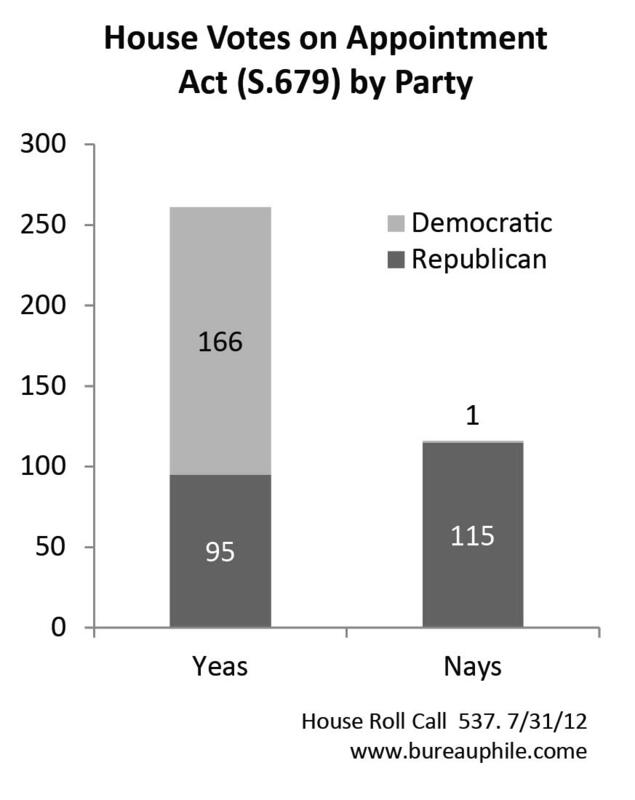 For those keeping score: Representative Paul Ryan (R-WI) was one of the Republican Yeas on the Appointments Act (S.679). As we at Bureauphile were shocked to learn earlier in the week, S. 679 successfully passed a House vote on July 31, 2012. We have done some very preliminary analysis of the impact of S. 679, which we presented at the “Appointee Politics and the Implications for Government Effectiveness” Workshop in Alexandria, VA on May 4th to some of the Senate committee staff responsible for writing the bill. Yesterday, the House passed S.679, a bill that reforms the presidential appointments process and reduces the number of presidential appointments subject to Senate confirmation. Everything I know about Congress is wrong! S.679 was a topic of interest, but a keen sense of skepticism among participants in May’s Appointees Workshop, an event sponsored by the Virginia Tech Center for Public Administration and Policy and the Indiana University School and Public and Environmental Affairs. I doubt any of the experts gathered to examine the role of appointees in American government would have predicted the bill’s passage this year. We will review elements of the new law in coming weeks, but for now a simple question: What happened to gridlock? But one man has already been sifting through secret emails about the operation known as Fast and Furious. He’s Michael Horowitz, the Justice Department’s new watchdog.